1. 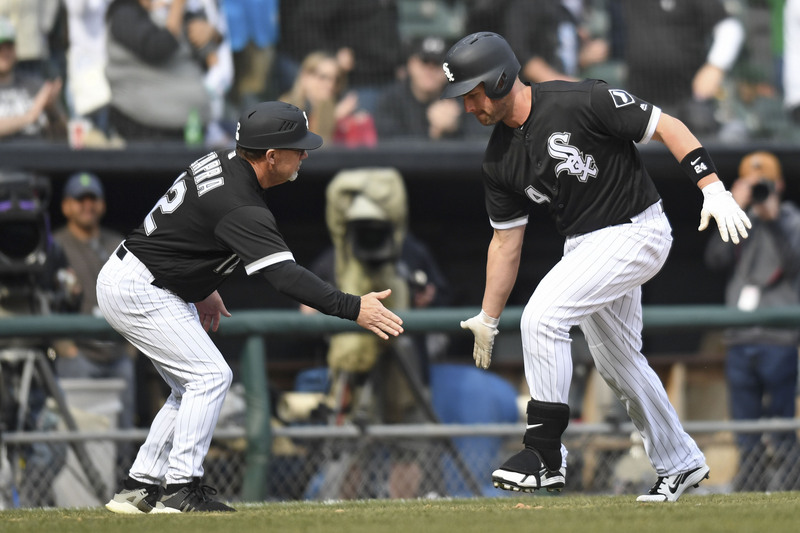 The White Sox snapped their five-game losing streak and salvaged a win to end an otherwise disastrous season-opening home stand thanks, almost entirely, to Matt Davidson. The home run and win will overshadow what was another sloppy and often times perplexing performance by the White Sox, which we’ll get to in detail below. But first, let’s check in on Davidson. The White Sox DH/part-time corner infielder has been something of a source of fascination in this space for a while, which isn’t surprising given the 27-year-old’s former prospect pedigree, prodigious power, and general likability. Nick Schaefer wrote about his impressive start Tuesday, and in just two games since that piece was published he’s added another homer and, more impressively, three more walks. He now has nine walks in 44 plate appearances after just 19 walks in 443 plate appearances a year ago. Nobody is going to confuse Davidson for Joey Votto anytime soon, but he’s among a handful of White Sox looking to prove he belongs on a major league roster, whether it’s in Chicago or elsewhere. Even a minor jump in OBP would make him immensely more valuable than the sub-replacement player we saw last year. 2. The White Sox went 0-for-9 with runners in scoring position in Wednesday’s win, and 3-for-35 during the three-game series. They’re 17-for-104 on the season, otherwise known as a .163 batting average. If you’re a regular reader of Baseball Prospectus, you likely don’t need me to tell you that RISP numbers are mostly noise, as players can only do so much to control when they get a hit. The White Sox, despite their RISP struggles, are still a top five team offensively. While that’s unlikely to continue, so too is their struggles hitting with base runners. Expect stabilization in both regards before long. 3. Failure to hit with runners aboard is one thing, but failure to properly execute is another. Had Davidson not delivered in the bottom of the eighth, Wednesday’s game would have been remembered for an embarrassing sequence where Yoan Moncada pulled back a bunt attempt on a squeeze play, leaving Omar Narvaez hanging out to dry. Rick Renteria confirmed after the game that the squeeze was, in fact on, and Moncada’s decision to pull back wasn’t the brightest idea, to say the least. 4. There isn’t much to say about the screw up other than that the White Sox and Moncada need to execute better, and one would hope that mental flubs of that sort will be less frequent when wins and losses start to matter more. Moncada himself has started to cause some consternation among folks concerned over his less-than-stellar start. It’s true that Moncada hasn’t performed as many had hoped through 11 games. It’s also true that despite his prospect pedigree, he’s yet to prove himself at the major league level. A .200/.321/.333 line leaves a lot to be desired, as does a 39.6 percent strikeout rate. Moncada has 304 career plate appearances at the major league level. There very well could come a time where his struggles will be concerning enough to start casting doubt on his future as an above-average regular. When that time will be — if it ever happens — I don’t yet know. I just know that time is not right now. 5. James Shields had one of the strangest starts in recent memory, which is saying a lot when you consider most of the 44 previous starts he’s made in a White Sox uniform. The much-maligned veteran starter walked five in the first two innings but came out of them unscathed. He was aided in the second inning by an out on the bases courtesy of Mallex Smith, as well as an inexplicable sacrifice bunt decision made by Rays manager Kevin Cash. In the third inning, he started doing something he didn’t do much of in his first two starts — missing bats, and when all was said and done he went 6 1/3 innings, struck out six, and allowed just one earned run, lowering his ERA to a surprisingly respectable 4.15. Shields is rough to watch even on his better days, but at the risk of diving too far into the cliche waters, the way he battles on a start-by-start basis, constantly making adjustments and trying new things in an attempt to find success, is damn respectable. At least when Shields struggles he tries to find ways to battle out of it. When Carson Fulmer struggles he starts getting emotional which just gives the opponents more confidence. Moncada’s plate discipline numbers still look fine, the only thing bad is the contact rate of pitches in the zone. If he keeps the plate discipline, the contact rate will probably improve. Alexei Ramirez was almost always terrible in April, and Abreu scuffles in the early going, too. Maybe the Sox should sign a couple Canadians to balance the offense for the April games.